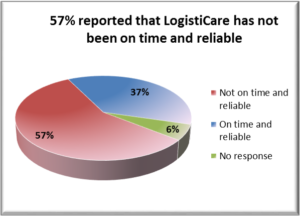 The purpose of the MHANJ conducting the Medicaid LogistiCare Transportation Feedback Survey was to better understand the quality of LogistiCare services from the point of view of those living with mental illness. LogistiCare is New Jersey’s Medicaid funded transportation service, providing transportation for Medicaid recipients to non-emergent doctor appointments. The survey was based on information obtained during meetings the MHANJ held at Wellness Centers throughout New Jersey with persons who had experience in using LogistiCare. During these meetings, four key areas of concern were identified: lack of punctuality and reliability; issues with the safety of vehicles and/or driver practices; driver interaction with passengers; and unresponsive handling of complaints. Nearly a third felt that safety was not a priority; reporting that drivers talk on their cell phones and text while driving, vehicle seatbelts are missing or broken, drivers speed/drive aggressively, etc.